Items 162- out of displayed. USD Index turned sharply up from 92.50 at the end of August, clearly in five waves which means that dollar is back on bullish track. That said, any downward retracement should be temporary and corrective. On the 4h chart we are tracking a wave 2) pullback which is now approaching an important support at 95.20 of a wave four of one lesser degree. Ideally market will turn up from there into a new bullish impulse. At the same time we also see a head and shoulder pattern, currently with right shoulder near completion. In that case an upward continuation will be confirmed once neckline is broken around 96.40. 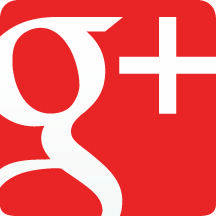 Try our service today for 1 Month For Only 1€!! WTI moved sharply from August low; it recovered around 30% in just five days, so move was very agresive. From an Elliott Wave perspective impulses are sharp; these are structured by five subwaves which tells us where the market is headed. To me it tells that temporary low is in place and that price will recover with minimum three waves above $50. On the 4h chart below we can clear see five waves up, which is big wave (a) or (i) as part of a big incompelte wave recovery. 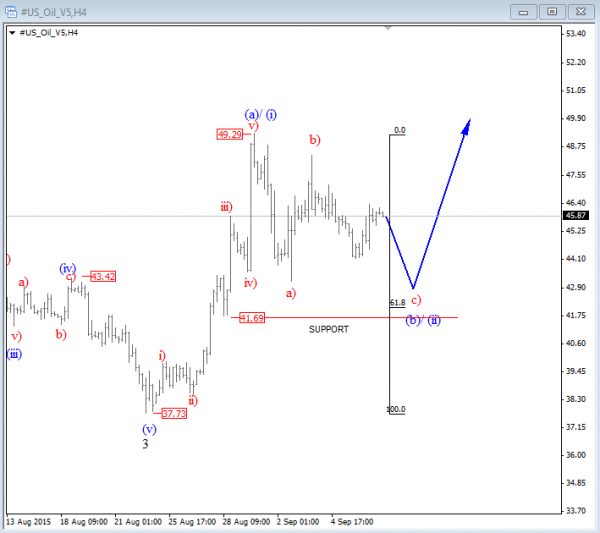 A sharp turn down from 49.30 last week suggests that WTI accomplished wave (a)/(i) and that market is in now in corrective pullback of a higher degree. 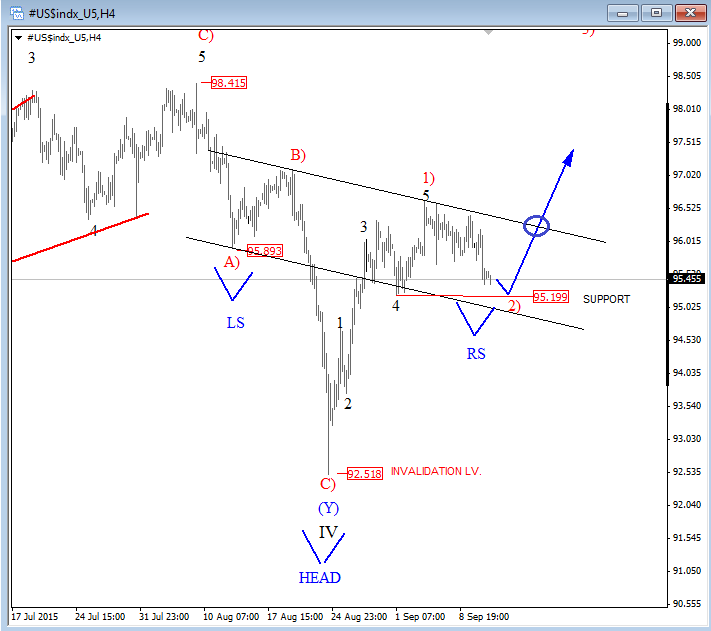 We are tracking wave (b) as labeled on the chart, which can be headed down to 41-43 area where we see nice support level. At 42.00 it’s wave c)=a) which comes in around very important 61.8% Fibonacci zone. That’s ideal area then for a possible bounce that can happen this month, when traders can be looking for longs. We will be looking for a move up, back to $50 per barrel as long as 37.70 is not breached. EURUSD moved sharply to the upside two weeks back, up to 1.1700 area from where price turned nicely down last week; clearly in five waves. A sharp reversal back beneath 1.1200 area suggests that pair found a top and most likely accomplished a corrective move from March 11, which suggests stronger USD in days ahead. 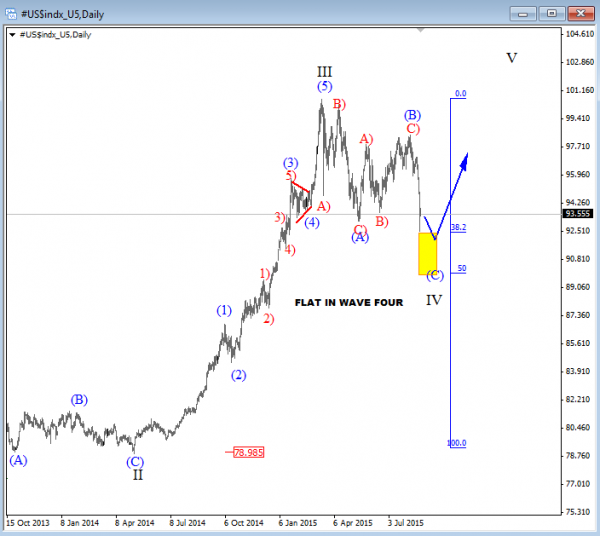 Below is our latest technical video analysis for the dollar and euro. 10 year notes moved sharply to the upside from Aug 19th when investors lost confidence for higher US interest rates during the FOMC Meeting minutes. At that time the S&P500 fell sharply from 2100 and continued down in days ahead, while 10-year US notes were rising. 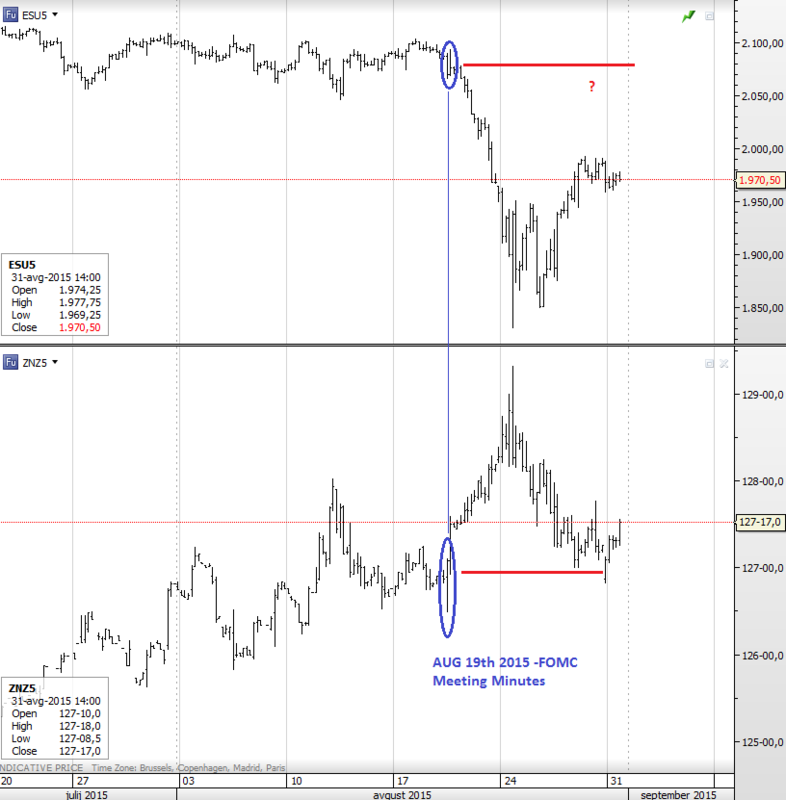 Well, notice that last week 10 year notes turned down back to the levels from Aug 19th while S&P500 did not! This shows gap on the S&P500 which is lagging. That said, just be aware of more upside on the US markets. Anyhow, keep an eye on 1923 figure on E-mini S&P500 (Sep 2015); if this one is broken then price will likely make a room for a new leg down. 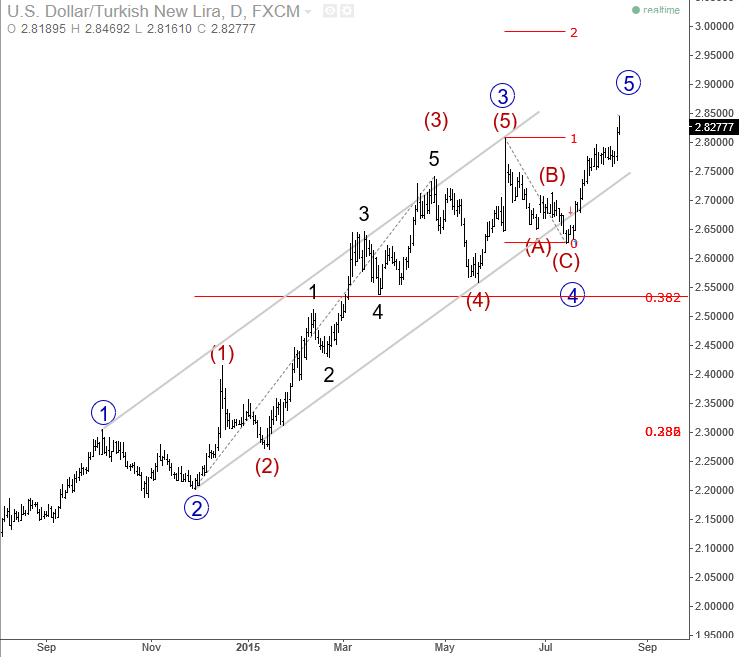 USD index is trading lower for the last few months but on the daily chart we still see a retracement as a corrective fourth wave. We are tracking a flat correction because of three waves down in (A), three up in (B) and now current strong sell-off is normal for impulsive wave (C). In fact we see price retracing into 38.2-50% Fibonacci levels compared to wave three, which is actually ideal Fibonacci zone for a base of current fourth wave. That said, it would definitely be too soon and too early to call any long-term top on the dollar. However, current strong bearish sentiment on intraday chart can send USD Index to around 90 psychological level before we may finally see a new bounce higher. We would give up on this view only if price would fall sharply through 89 figure! 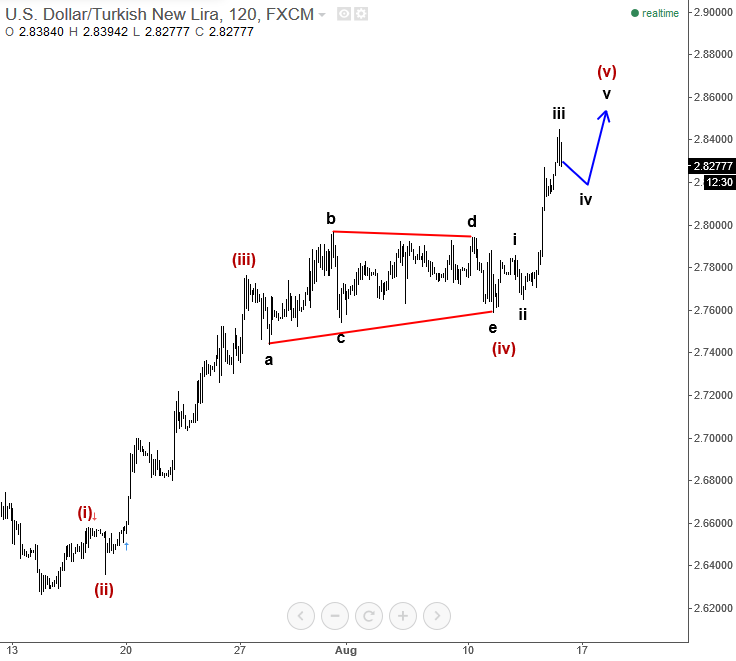 Dollar is bullish when compared to Turkish Lira but we see move out from a triangle in wave (iv) as shown on the 2h chart, which means that uptrend can be in final stages to complete wave 5-circle on a daily chart. Ideally near 2.8800-2.9000. So for the short-term traders there can be still some room for longs after coming black subwave iv. 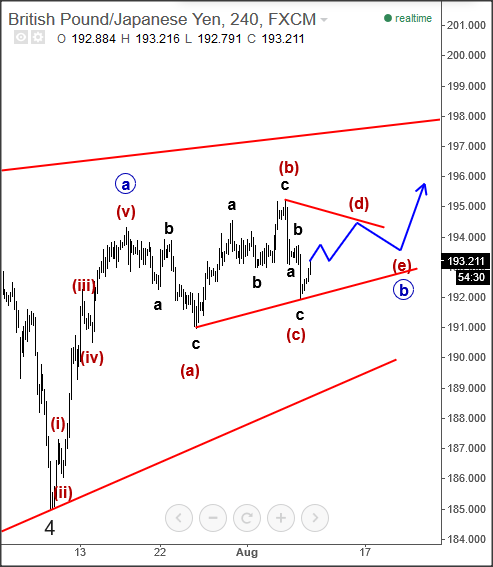 GBPJPY has turned down last week, but notice that weakness occurred after a completed three wave rise from 191.00 to around 195.30. This is a corrective structure that belongs to a bigger and more complex pattern. Our primary scenario shows idea of a triangle placed in wave (b)-circled so uptrend could still continue but after wave (e) is done.